Kurbrick is a software framework/library for interactive video fiction, or QTE games, like Dragon's Lair in the browser. It uses the YouTube API to control the video stream according to the appropriate keypresses. 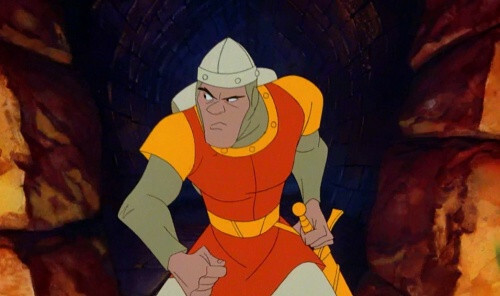 The project started as a consequence of finding the complete video play-through of Dragon's Lair on YouTube. Knowing how stupidly difficult the game was originally, I found it fantastic to watch how the story played out, and how the clips in the attract screens fit into the narrative. Since it had been a while since I'd explored the YouTube API my brain slowly put 2 and 2 together, and so I was able to produce a complete web-version of the game. There are only two problematic parts of the project. The first was needing a supplementary video clip showing all the death scenes. I had, therefore, to control two different playback pointers and switch the appropriate video in-situ at each stage. It wasn't difficult, TBH, just annoying to ensure each edge case was handled. It does, at least, make for a better engine since an arbitrary number of videos can now be included in the playback data set. This is useful, given the limit on duration on YouTube videos. The second issue was in creating the data set. I had a walkthrough of the whole game, but still needed to time - to the frame - every section of the game, along with the precise time points at which each player action should occur. The YouTube API is not 100% accurate, and doesn't always stop in the place you ask it. Sometimes, you have to amend the edit points to represent a time preceeding the one you require, just to stop too much of the next scene playing. If I were to do this again, I'd download the video, re-edit it with nice gaps, and upload to a second account.